Here’s the BBC link; more on this later, but in a nutshell I am eager to compare this to the audiobook for And Another Thing that was narrated (solely) by Simon Jones, which was utterly brilliant. If you love H2G2, then buy everything in every format, so we can convince Eoin Colfer to write a sequel 🙂 I might have to start stalking him on Twitter. There isn’t that much new here, but more details on cast, and confirmation that it will based on Eoin Colfer’s fantastic And Another Thing… which I bought as an audiobook because Simon Jones is the narrator – so it’s Arthur as Arthur. I can’t even express the joy I feel when I hear him reprise his role. Hexagonal Phase will be an interesting contrast. In a way I kind of enjoyed Jones’ take on Zaphod in the audiobook more. But it doesn’t matter. I’m obsessed. Trillian will return, with a new voice actor. And we have a new voice of the Book, too. Hexagonal Phase in 2017? freeeeow! More than a decade since the show last aired in 2005, a new season of the sci-fi comedy series has been commissioned. The sixth season is expected to be titled ‘The Hexagonal Phase’, the British Comedy Guide reports. The new episodes will apparently be based on And Another Thing…., author Eoin Colfer’s 2009 book featuring the characters created by Doctor Who writer Douglas Adams, who died in 2001. The original radio cast is expected to return for the six episodes, which will again be overseen by director Dirk Maggs. You know what? I’m game for this. 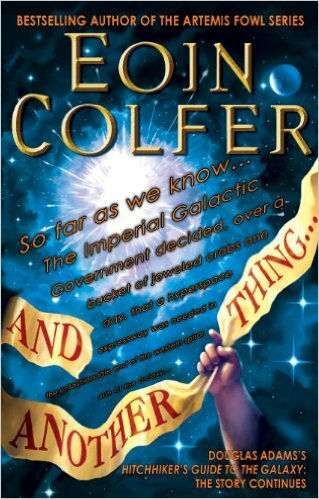 I haven’t even read Colfer’s sequel but this might be the excuse I need. 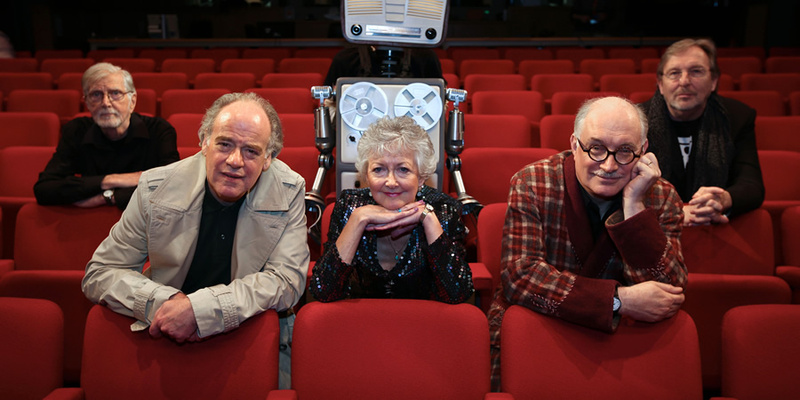 And the fact that they are reuniting the original radio cast means they actually give a pair of Zarquon’s singing fish about Douglas Adams’ legacy. Simon Jones who plays Arthur Dent, Geoffrey McGivern (Ford Prefect), Mark Wing-Davey (Zaphod Beeblebrox), and Stephen Moore (Marvin) last reunited with Maggs in 2014 to record a special one-off live transmission for Radio 4, The Hitchhiker’s Guide To The Galaxy Live. The episode also saw Susan Sheridan reprise her role as Trillian. It would prove to be her last time playing the character, as she died in August 2015. I am saddened to hear that Trillian has passed away too. This means I need to find that audio ASAP and make a new master playlist. That’s the last True Trillian. As far as adaptations go, the only ones ever worth a damn were the ones with this crew. That includes the TV series they made – the long-awaited movie was such a travesty that I can’t even. The bottom line: I am looking forward to this. Simon Jones IS Arthur Dent. Geoffrey McGivern IS Ford Prefect. 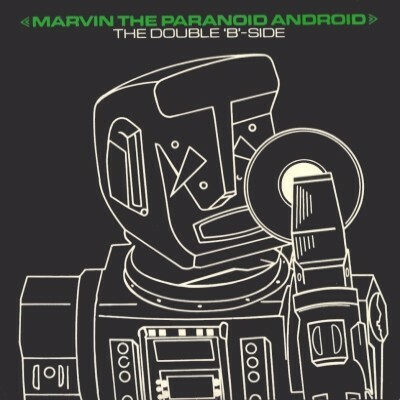 Steven Moore IS Marvin. And Mark Wing-Davey IS Zaphod Beeblebrox. Where those three goofballs go, I’ll follow, and gladly. As my site archives on H2G2 attest, I am something of a Hitchhiker’s Guide to the Galaxy aficionado – if I had to rate my fandom, H2G2 would stand far above even Star Wars and Star Trek in my personal pantheon. Click over to Google today (or check out the Doodle Archive page if you are coming late) to see the Doodle in all it’s glory. 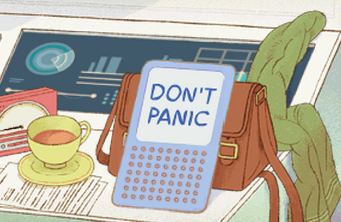 It’s got the requisite towel, cup of liquid that is exactly but not quite unlike tea, and of course the Guide itself, with “Don’t Panic” written on the front in large, friendly letters. And there’s a touch of Whovian/70’s scifi chic and sound effects to boot. Bonus tip: try actually using the Guide. Douglas Adams would have been 61 years old today. He was one really, amazingly together guy. He was more than just a hoopy frood; he was so hip he had difficulty seeing over his pelvis. He was so cool you could store a side of beef in him for a month. He deserves not one Google Doodle, but 42 of them. I am transcribing this segment from The Hitchhiker’s Guide, Secondary Phase, for posterity. The Total Perspective Votex derives its picture of the whole Universe on the principle of extrapolated matter analyses. To explain, since every piece of matter in the Universe is in some way affected by every other piece of matter in the Universe, it is in theory possible to extrapolate the whole of creation – every sun, every planet, their orbits, their composition, and their economic and social histories – from, say, one small piece of fairy cake. Trin Tragula – for that was his name – was a dreamer, a thinker, a speculative philosopher or, as his wife would have it, an idiot. “Have some sense of proportion!” she would say, sometimes as often as thirty-eight times a day. And so he built the Total Perspective Vortex, just to show her. And into one end, he plugged the whole of reality (as extrapolated from a piece of fairy cake), and into the other, he plugged his wife, so that when he turned it on she saw in one instant the whole infinity of creation and herself in relation to it. To Trin Tragula’s horror, the shock completely annihilated her brain, but to his satisfaction he realized that he had proved once and for all that if life is going to exist in a Universe of this size, then the one thing it cannot afford to have is a sense of proportion. 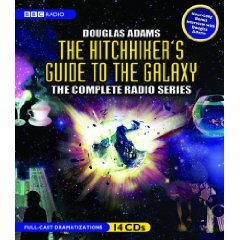 This segment ranks among my most favorite moments of the Hitchhiker’s Guide to the Galaxy – Secondary Phase, Fit the Eleventh, to be precise (the BBC radio series is the True version of the Guide, without all that tedious mucking about with printed pages). Part of the brilliance is the twisted, yet straightforward, logic of the economic theory itself. But what makes it gold is how the narrative is presented in a teacher-student context, with a rather.. twisted… take on academic incentives. I’ve decided to waste 15 minutes of my life and transcribe the good bit below. Then stand up. Harsh Economic Truths, class 17. Are you standing up? Good. Posit. You are living in an exciting, go-ahead civilization. Where are you looking? The open sky… the stars… an infinite horizon. Correct! You may press the button. Thank you! (tinkly music plays) Oh! That feels nice. Posit. You are living in a stagnant, declining civilization. Where are you looking? Correct! What do you do to cheer yourself up? Incorrect! Think again. Your world is a depressing place. You are looking at your shoes. How do you cheer yourself up? I buy a new pair. Can I press the button? (twinkly music plays) Oh ho! So nice! Now. Imagine everyone does the same thing. What happens? Ah, forget the button, concentrate! Everyone buys new shoes. What happens? And in order to support all these extra shoe shops, what must happen? Everyone must keep buying shoes. And how is that arranged? Manufacturers dictate more and more fashions and make shoes so bad that they either hurt the feet or fall apart. Everyone has to buy more shoes. Until… everyone gets fed up with lousy rotten shoes. (plaintive) Why can’t I press the button? And then what? Come on! Massive capital investment by the manufacturers to try and make people buy the shoes. (insistent) And then we reach what point? (sullen) The point where I press the button again. (twinkly music plays) Woo hoo hoo! Ah! That’s so nice! That’s really nice! And then we reach what point? (sighing with bliss) The Shoe Event Horizon! The whole economy overbalances! Shoe shops outnumber every other kind of shop! It becomes economically impossible to build anything other than shoe shops, and bingo! I get to press the button again! (twinkly music plays) Wooooo hoooo!!!! (angry) Wait for permission!!! Now, what’s the final stage? (distracted) Um. Every shop in the world ends up as a shoe shop. Shoes no one can wear. Famine, collapse, and ruin… any survivors eventually evolve into… birds… and never put their feet on the ground again. Excellent! End of lesson! You may press the button! (twinkly music plays) Woo hoo hoo! Yee hoo hoo hoo! Oh ho! Oh, that’s nice! Thank you teach, goodbye! Ahem, aren’t you forgetting something? (twinkly music plays) Ooh ho ho ho! Woo hah hah hah! Wha ha hah ha ha ha!